If you’re in Rome and wish to visit a place that’s out of the usual tourist itinerary, then the Non-Catholic Cemetery may be exactly what you’re looking for. 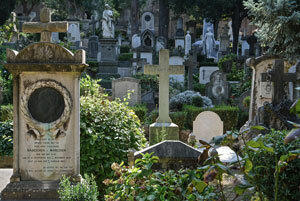 Despite the fact that its fame can’t be compared to Père-Lachaise or Montmartre in Paris, the Non-Catholic Cemetery in Rome features illustrious poets such as John Keats and Percy Shelley. The view on the Pyramid of Cestius; ruins and tombs inspired by the classical era; the cypress and the pines’ shade; the absence of noise; all these elements instill a sense of deep calm in the visitor. The visitor feels as he is somewhere else, almost in another dimension, far away from the city chaos. 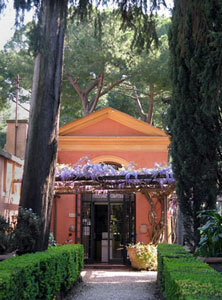 A peaceful oasis in the middle of Testaccio neighborhood. To whom is dedicated to? Known also as Protestant Cemetery or Cemetery of the English, the Non-Catholic Cemetery features the graves of almost four thousand people. They’re mostly non-catholic foreign people that lived for the most part of their lifetime in Rome: english, germans, americans, scandinavians, russians, greeks, a few chinese and other far east countries. Among them internationally recognised artists, writers, poets, sculptors, but also historians, archaeologists, diplomats, scientists and architects. There are also some italians, people that lived their lives almost as outsiders in their own country. The origin of the Non-Catholic Cemetery. The Catholic Church rules and regulations forbid the burial of protestant worshippers in Catholic churches and consecrated lands. However, the Catholic Church allowed some spaces to be destined to the burial of non-catholic people. In 1716 Pope Clemente XI allowed members of the Corte Stuart in exhile to be buried in front of Pyramid of Cestius. This exception would then be extended to other non-catholic people. Around the end of ‘800 the cemetery turned into what basically is today. In 1918 it was declared monument of national interest. Keats and Shelley’s tombs. For poetry lovers the graves of John Keats and Percy Shelley are a must. The former died of tuberculosis in 1821 in Rome. On his tomb you can read the words of his friends Joseph Severn and Charles Brown: This grave contains all that was mortal, of a YOUNG ENGLISH POET, who on his death bed, in the bitterness of his heart, at the malicious power of his enemies, desired these words to be engraven on his tombstone: Here lies one whose name was writ in water”. The Non-Catholic Church also hosts the ashes of Percy Shelley who died in the open sea between Liguria and Toscana. He was cremated on the beach near Viareggio. The Angel of Grief. 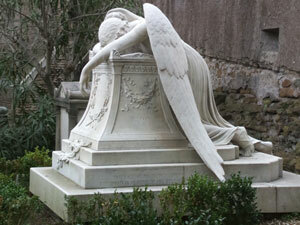 The most famous and moving monument in the cemetery is without a doubt the Angel of Grief. It was sculpted by the american sculptor William Wetmore Story for his wife’s tomb. The monument also features the remains of the author, who died a few months after completing the work. Gramsci’s tomb. The writing on the gravestone on Antonio Gramsci’s tomb (Gramsci was an italian marxist theorist and politician) recites simply Cinera Antonii Gramscii. His burial inspired some of the most popular lines by the italian film director, poet, writer and intellectual Pier Paolo Pasolini, Gramsci’s Ashes. The cats of the cat colony. Cat lovers will have a nice surprise to share their stay at cemetery with hundreds of cats in the cat colony near the Pyramid of Cestius. Cats love this place because of the shade and the calm environment. Booking group tours. In order to respect the dead and to protect the integrity of the site, the groups of visitors have access only upon previous reservation made by e-mail to ornella.forte@cemeteryrome.it. In the mail you need to specify the group country of origin, the name and contact of the person responsible, date and time of visit and number of people involved..
Group tours with private tour guide. It should be noted that groups with own tour guide cannot exceed the 20 units (otherwise they need to separate in two groups). Also visits by school groups can be booked only if kids are 16 or older. Group tours with a voluntary worker. You can book a guided tour that lasts about an hour and it’s in italian, english and german for groups between 10 and 20 members. The request must be forwarded at least 10 days in advance using the form on the official website of the Non-Catholic cemetery. Toilets. The cemetery features a public toilet. Pyramid of Cestius. From the cemetery park you have a nice view of the Pyramid of Cestius although it is not directly accessible (it can be visited only on a guided tour). Comfortable shoes. The ground of the cemetery is uneven. Therefore we recommend to wear comfortable shoes. Sundays and holidays: 9:00 - 13:00 (last entrance 12:30). The cemetery supports itself thanks to the land concessions for the burials and the fees for the maintenance of the gravestones. Visitors are asked for a contribution of 3 Euros as a donation. 6 Euros to take part to tour guided by voluntary workers. Bus: you can get there with lines 3, 23, 30, 60, 75, 83, 95, 175 and 280.